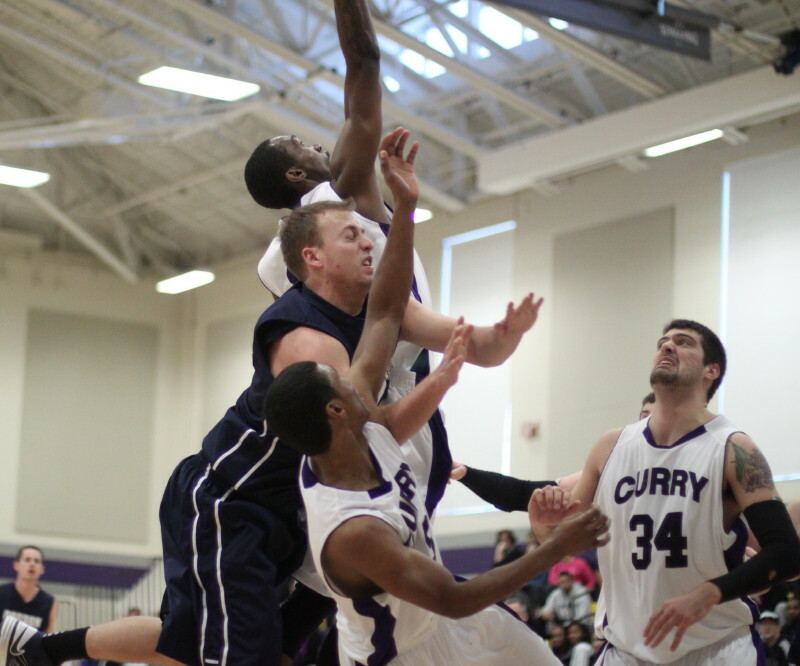 Sedale Jones (16 points) tries to go under and up. (Milton) Gordon ended a five-game win streak and messed up a chance to tie for the top spot in the Commonwealth Coast Conference by losing to Curry, 84-76, on Saturday afternoon. With the victory, the Colonels (9-2) stand alone in first with three teams (Gordon, Eastern Nazarene, Wentworth) two games out at 7-4. There are still seven CCC games left to sort out the final standings. However, Gordon has dropped both games to Curry and will have to wait until the post-season tournament for a possible rematch with them. Curry (12-6 overall) had six players in double figures and had plenty of crowd-pleasing passes and individual moves. Gordon (12-6 overall) was not as consistent offensively as we seen them in most of January. In the first half they shot themselves into a 20-12 lead midway and then went five minutes scoring just two points and trailed, 23-22. 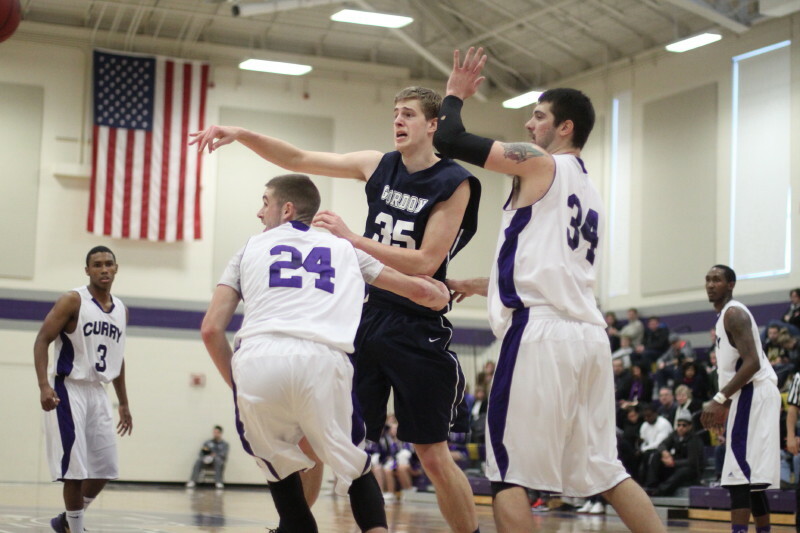 The Scots were down by five (31-26) at halftime. Midway through the second half (10:19) Gordon found themselves down fifteen (57-42) and looking to be on their way to an embarrassing loss. 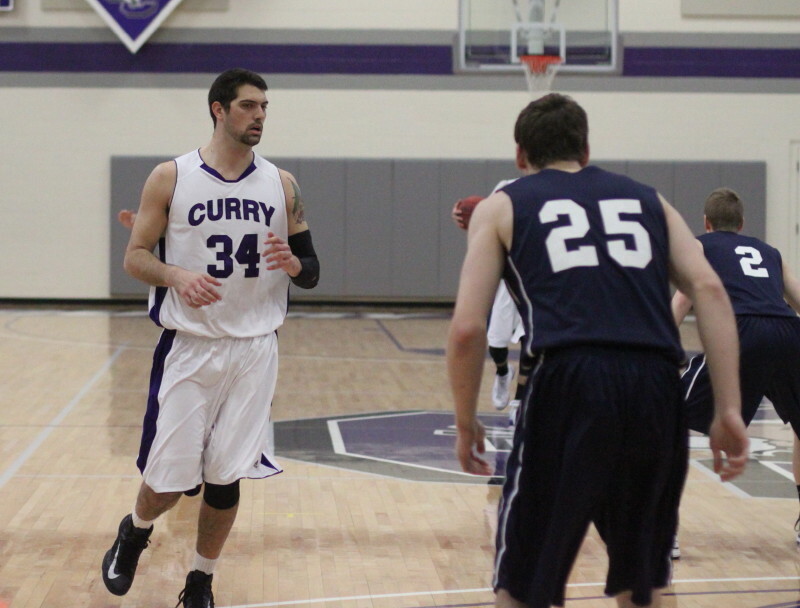 The Scots weren’t shooting badly, they just couldn’t stop Curry’s multi-faceted attack. The Colonels lead (62-49) was still substantial with 6:48 remaining before the Scots made their move. Three’s by Park Thomas and Luke Hamilton led Gordon on an 18-8 segment and finally they were close (65-60) with 3:24 left. 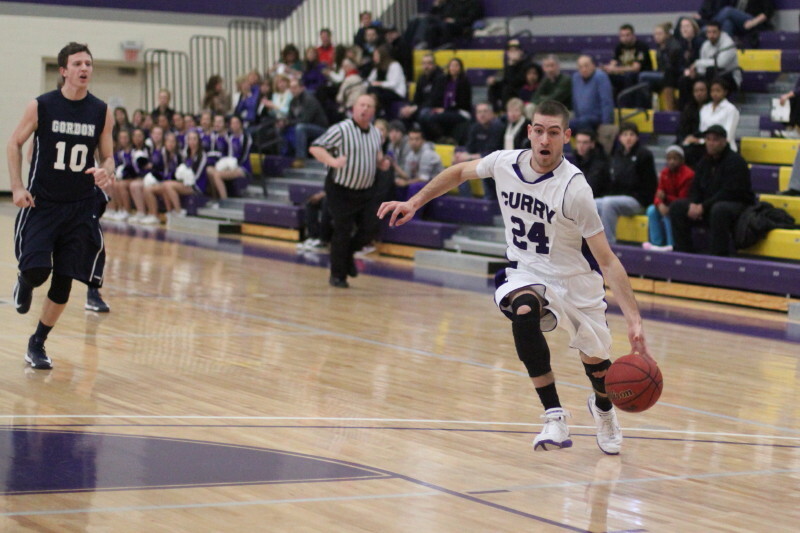 Lambros Papalambros (14 points) was one of six Curry players in double figures. The next minute doomed the Scots. 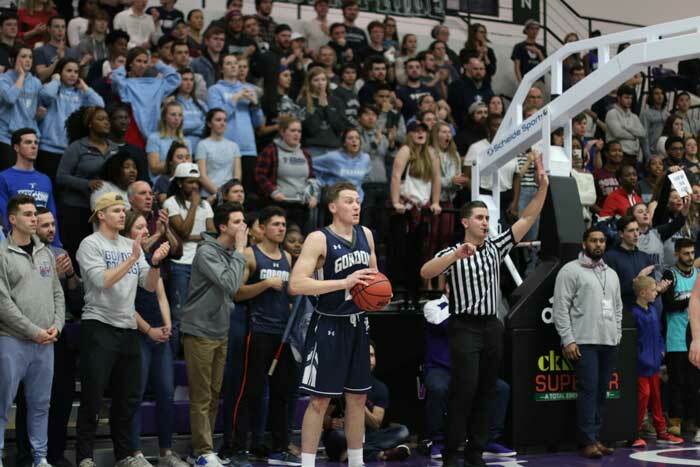 While Sedale Jones (16 points) made a free throw, and Lambros Papalambros (14 points) made an old-fashioned three, Gordon had only a missed three by Luke Hamilton. This action left Gordon down by nine (69-60) and there weren’t enough stops and shots the rest of the way to pull this one out. I was very impressed with the balanced attack of Curry. They turned up a host of layups for each other with their unselfishness. 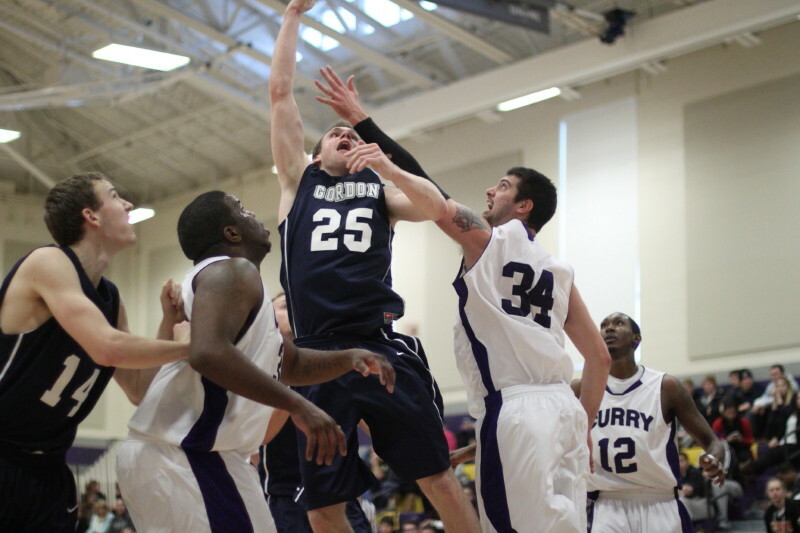 David Dempsey (22 points) topped all scorers and jumped two places to eighth in the All-Time GC scoring list. He now has 1306 points. This afternoon he moved past Gene Fitzgerald (1297) and Nathan Uebelhoer (1305). Ahead, currently in seventh, is Tim Kehoe with 1397. A big positive in this game was Alex Carnes’ season-high eighteen points. The 6-4 junior collected fourteen of them in the second half as a big part of the late run that made things interesting down the stretch. 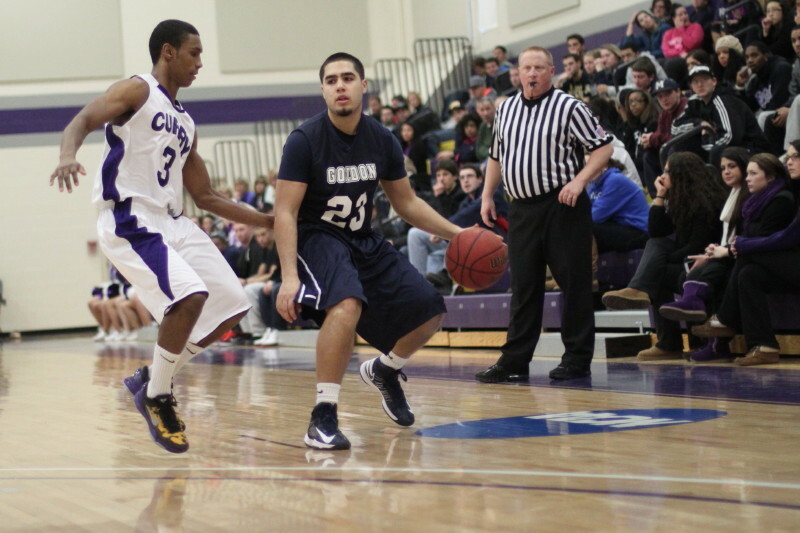 The 18 points were Alex’s second-best scoring game at GC. 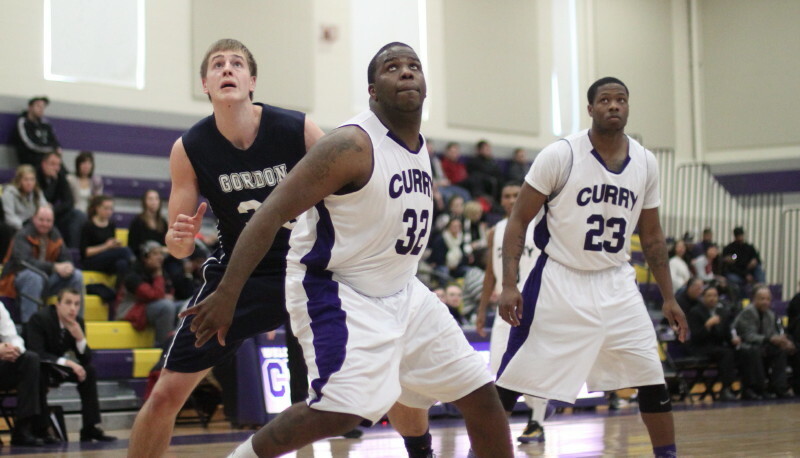 He had 21 against Salve Regina last season. The biggest reason Curry won? The return of AJ Stephens. AJ has been gone for eight games. The 6-5 junior cannot be single covered and the extra defensive attention paid to him left openings for teammates. He was part of the collection of Colonels in double figures. AJ also gathered seven rebounds. Good student crowd on hand. Their biggest cheer may well have been for Sedale Jones’ block of Luke Hamilton’s attempted 3-point shot from the corner. Gordon can not expect to do very well when they miss nine free throws. They got away with that deficiency against Western New England last game but not this time. Gordon can not expect to do very well when Hans Miersma takes only four shots and score three points. The double-teams he faced should have led to open teammates elsewhere. He had two shots in the loss to UNE, three shots in the loss to Lynchburg, and three shots in the loss early in the season to Western New England. There is a pattern. 5-10 junior Carlos Ribeiro was the most efficient of the Colonels earning a +17. He was definitely helped by getting a surprising seven rebounds to go with his fourteen points. 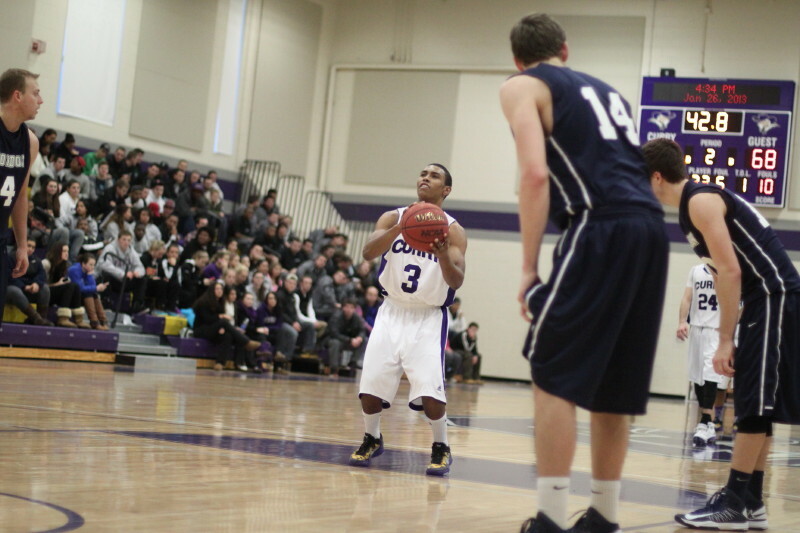 Tuesday night the Scots continue on the road with an 8PM meeting with Roger Williams at Bristol (RI). 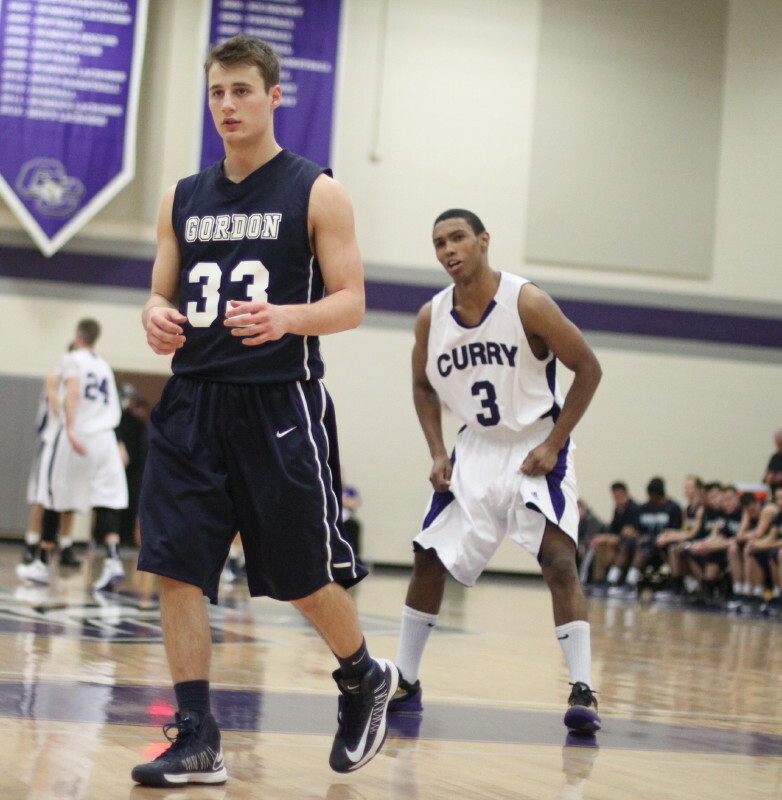 Curry will have to deal with UNE in Biddeford (ME) on the same night. 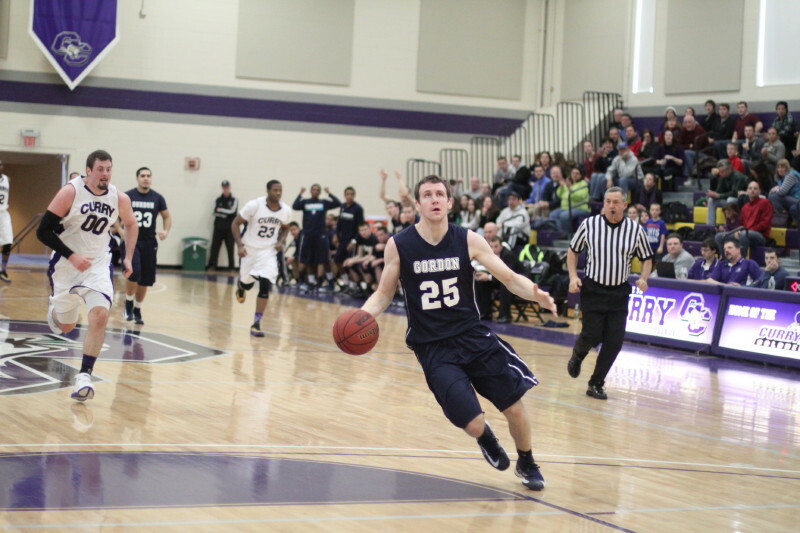 The Nor’Easters upset Salve Regina this afternoon. Having the snack bar and the cafeteria in the same building as the gymnasium sort of replicates home. At home, lulls in the action on TV give opportunity for a dash to the refrigerator. Here at Curry, many of the students exited at halftime for a snack bar visit. The worrywart in me surfaces as I think about Gordon’s next three games. Roger Williams (Tuesday) is a team that we have seldom defeated at their place. UNE (Thursday) has already beaten us once and I’m not sure we’ve figured out how to handle Devin Thompson and their zone defense. Eastern Nazarene (Saturday) has point guard Max Barbosa back and I know that they are a better team than what GC faced on January 5th. However, that worrywart thinking fits better with the 2011-12 team. This year’s edition won five straight, and ten-of-eleven before the Curry loss. 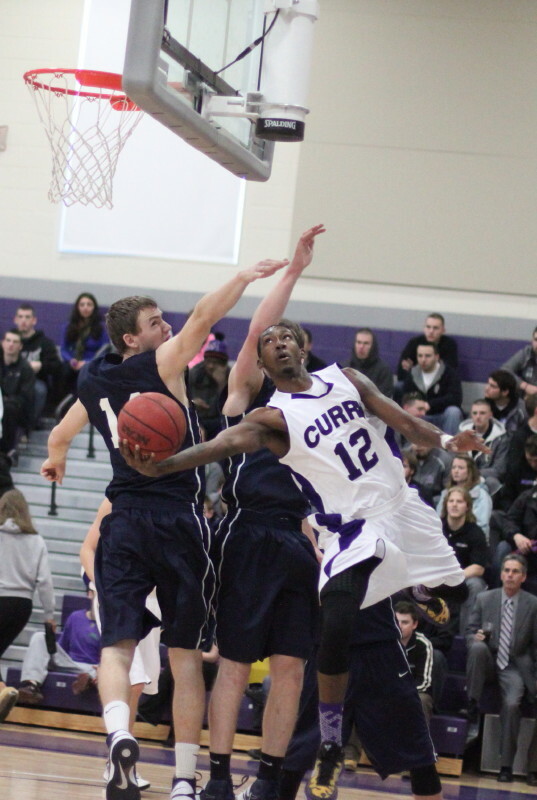 After their loss to UNE, they responded with five straight victories. Efficiency is arrived at by subtracting the bad stats (missed field goals, missed free throws, turnovers) from the good stats (rebounds, points, assists, blocks, steals).